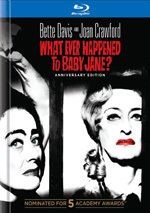 With 1952�s Sudden Fear, we find a film noir that stars Joan Crawford. Actor Lester Blaine (Jack Palance) gets the lead in a new play by famous writer Myra Hudson (Crawford). However, she eventually fires him because she feels he doesn�t look �romantic enough� for the part. This leaves Lester spurned and angry, but emotions appear to change not too long after his dismissal. On a train ride across country, Lester woos Myra and before long, he convinces her to marry him. All seems well � until Lester�s lover Irene Neves (Gloria Grahame) winds up in town. She reconnects with Lester and the pair plot Myra�s demise so he can inherit her fortune. Myra discovers this scheme and contends with its ramifications. Like most of my generation, my primary acquaintance with Crawford comes via her terrible parental reputation as told in the campy biopic Mommie Dearest. Via this site, I�ve seen a few of Crawford�s films over the years, but I admit I still don�t have great feel for her screen work. 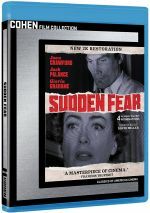 Sudden Fear adds to that education, and it does so in a way that contrasts with my last Crawford experience: 1954�s Johnny Guitar, a Blu-ray I viewed a couple months before I got Fear. Of the two, Guitar presents a superior effort, especially in terms of Crawford�s acting. In Guitar, Crawford plays the tough as nails proprietor of a Western saloon who battles off opponents. That�s a far cry from Myra, a role who turns awfully clingy and needy. Those traits don�t seem to fit Crawford, as she fares better when she portrays a more take-charge character. Too much of Fear forces Crawford to seem passive and like a victim, and the actor doesn�t really match those traits. When asked to look lovestruck, Crawford seems more psychotic than anything else. Palance seems better suited for his role, as he connects well with the slippery Lester. He manages to convince us that Lester cares for Myra but he also adds shifts to the character when those become appropriate. Palance pulls off the part�s dimensions well. In terms of story, Fear struggles to fill its 110 minutes and might work better at a shorter length. In particular, we find ourselves stuck with endless shots of Myra as she stews and worries. We get that her relationship with Lester causes her angst, but the film sticks us with too much material that intends to depict her inner concerns, and these scenes create a real drag on the proceedings. In addition, Fear suffers from a narrative that lacks logic. When Myra finds out about Lester�s murderous plans, she pursues her own methods to contend with him and to foil these actions. Which begs the question: why not go to the police? Myra possesses concrete evidence of Lester�s plans, so why play games with him? I�d think she�d want to get law enforcement involved and end the threat immediately. Of course, if that occurred, we wouldn�t have much of a movie, and despite the amount of credulity stretched, the second half of Fear manages reasonable intrigue. That segment of the film allows Crawford to make Myra more dynamic, a factor that partly negates her prior passivity. But it�s not quite enough. The combination of a far-fetched plot and an often awkward performance by Crawford causes more damage to Sudden Fear than the film can overcome. While this thriller offers moderate entertainment, it fails to engage on a consistent basis. Sudden Fear appears in an aspect ratio of approximately 1.37:1 on this Blu-ray Disc. The movie came with a watchable but erratic transfer. Sharpness seemed up and down. Much of the film offered reasonable clarity, but wider shots tended toward too much softness. I noticed no issues with shimmering or jaggies, but light edge haloes cropped up at times. With natural grain, I didn�t suspect digital noise reduction here, and print flaws were absent. Blacks seemed dark and deep, but contrast was less impressive, as whites appeared a bit too bright on occasion. Shadows showed fairly good delineation. All of this brought us an average presentation. I also didn�t find anything stellar via the film�s iffy LPCM monaural soundtrack. Audio quality was adequate for its age but no better. Speech tended to be somewhat brittle and sibilant, but the lines remained intelligible enough. Music also showed some shrill qualities, and effects seemed slightly rough. Occasional instances of background noise crept into the proceedings. This seemed like a spotty track, even given its era. In terms of extras, we find an audio commentary from film historian Jeremy Arnold. He presents a running, screen-specific look at the source novel�s adaptation and character/story areas, cast and crew, music, sets and locations, themes, interpretation, and the movie�s reception. Arnold provides a quality historical commentary. He touches on a good mix of topics and moves the discussion along at a good pace. We learn a fair amount about the production in this useful chat. The disc opens with ads for Howards End, Daughtes of the Dust, Come What May, The Chabrol Collection and The People Vs. Fritz Bauer. We also find a trailer for Fear. The package also includes a booklet. It comes with photos and credits but lacks any essays or other text. As a thriller, Sudden Fear lacks consistency. While its second half picks up the pace, the story stretches believability too far and the plot sags too much of the time. The Blu-ray comes with erratic picture and audio as well as an informative commentary. Sudden Fear delivers an up and down piece.